We’ve been reading about ocean creatures a lot lately, especially jellyfish. 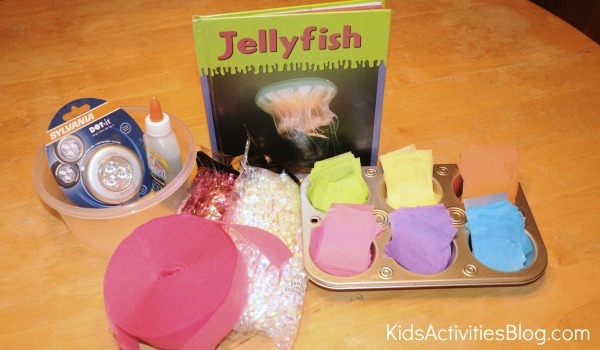 I started pulling together some supplies for my preschooler to make a little jellyfish craft project with a paper plate. But we decided to take it a step further and make our jellyfish glow like those found deep in the dark depths of the ocean. 1. The bowl will be the main body of the jellyfish. It is called the “bell” on a jellyfish. My kids couldn’t wait to play with the tap light so they installed it first. Ours cost about $5.00 at our local hardware store. The package included velcro to attach it. We installed it on the inside of the bowl. 2. Use glue and tissue paper squares to cover the outside of the bowl. Glue sticks would probably be less messy. Our jellyfish had to dry overnight before moving past this stage because they were oozing with glue. 3. Once the bell is dry, use glue or even just regular tape to attach strips of streamer or tinsel along the inside edge of the bowl. 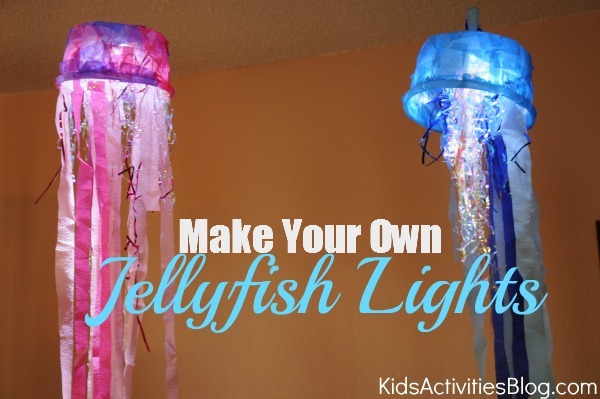 Real jellyfish have all different lengths and textures to their tentacles so let your kids get creative. 4. Lastly, you will need to attach a string to the bowl so that it can hang. I thought about just taping string to the top. However, the bowl was already covered with tissue paper so it was hard to find a good place to stick the string and be sure that it was secure. I ended up punching two holes in the top, threading some clear fishing line through, and tying it off. I love hands on projects that support what we are learning about. As we made the jellyfish lights, we talked more about their lack of a brain, how they pulse in the water, and how they must rely on their tentacles to catch their food for them. Previous Post: « Dinosaurs Rule Our Backyard ~ Thanks Dino Dan! What fun! We have been reading about jellyfish at my house. JDaniel would love these. Ooooh, this is fun 🙂 Thanks for sharing! We just made these at my daughter’s 10th “under-the-sea'” themed birthday party. We had 12 kids (ages 6-12) building these at once and while they were dubious at the beginning, when they finished and turned them on in a dark room they were all very impressed. Great project! Thank you for posting it. Also, glue sticks worked like a charm. Easy for the kids to use, minimal mess, quick drying time. Thanks for the tip in your instructions! p.s. we bought everything at our local Dollar Tree. I figure they cost about $3.50 each. We are doing FIAR and I am homeschooling my son who is in kindergarten. The book we are rowing this week is Night of the Moonjellies and so I saw your post through pinterest and knew I had to make these! I got all the supplies together-I had everything already except for the lights which I found at the Dollar Tree! So my cost for this project is only $2.00 + tax 🙂 Thanks for posting!! !